*Other topping ideas: Marinara or pizza sauce with your favorite toppings. Pesto with thin sliced tomato and fresh mozzarella. Alfredo with sausage, mushrooms, Provolone & Asiago cheese. Barbecue sauce with shredded chicken, green onions and smoked gouda. *This pizza is best served on a plate with a fork. Shred the cauliflower into small crumbles. You can use the food processor if you'd like, but you just want crumbles, not puree. You'll need a total of about 2 cups or so of cauliflower crumbles (which is about half a large head of cauliflower. Place the cauliflower crumbles in a large bowl and microwave them (dry) for 8 minutes (see Tips above if you do not have a microwave). Give the cauliflower a chance to cool. Prepare the crust: Preheat the oven to 450 degrees F. Spray a cookie sheet or pizza pan with nonstick spray (or use a nonstick surface). In a medium bowl, mix the cauliflower crumbles (about 1 1/2 cups since they shrink after cooking) with the remaining crust ingredients. Pat the "crust" into a 9 to 12-inch round on the prepared pan. Spray the crust lightly with nonstick spray and bake for 15 minutes (or until golden). Remove the crust from the oven and turn the heat up to broil. Prepare the pizza: Spread the sauce on top of the baked crust, leaving a 1/2-inch border around the edge. Sprinkle 1/4 cup cheese on top. Add the bacon and pineapple, spreading it out around the pizza. Sprinkle the remaining cheese on top. Broil the pizza 3 to 4 minutes, or until the toppings are hot and the cheese is melted and bubbly. Cut into 6 slices and serve immediately. 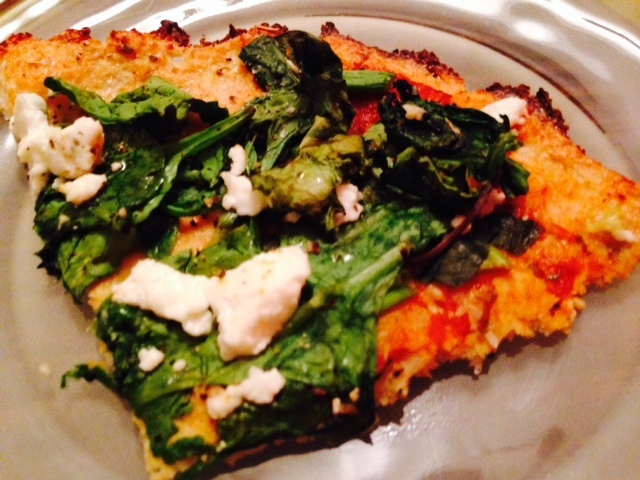 4 Pings/Trackbacks for "Gluten free, Paleo Cauliflower Crust Pizza"